The first thing to note about weatherproof security cameras is that they’re not waterproof. Any device that is waterproof is completely impervious to water. In general, waterproof cameras are the ones people use to take underwater photographs. Outdoor security cameras don’t need to be waterproof, but they do need to be weatherproof if they’re to stand the test of time. In this piece we look at what makes a great outdoor security camera truly weatherproof and protected against all the elements. What Rating Do You Need? Proper outdoor security cameras come equipped with a weatherproof cover or housing. The purpose of these coverings is to keep out moisture, dust and dirt so that it cannot get inside and damage the camera’s internal components. Some even come with vandal proof housings. These consist of high quality baked-enamels, stainless-steel and painted-steel casings. As the name suggests, weatherproof cameras can withstand weather conditions. This will include rain, sleet, snow, and whatever else Mother Nature throws their way. However, not all weatherproof home security cameras are alike, hence this guide on how to get the most value for your buck. In short, water; damp, persistent condensation and wind do not pose a threat to these kinds of security cameras. However, there’s a bit more to choosing one of these systems than first meets the eye. All high quality outdoor cameras have something called an environmental rating. This rating indicates the camera’s suitability for use in certain environments. It sounds technical, but it’s actually very easy to read and useful to consumers. We base an outdoor security camera’s suitability on its Ingress Protection (IP) rating (not to be confused with Intellectual Property or IP address). The specifications page of any camera model should determine its environmental rating. Let’s take a closer look at these ratings and see how they can help you make a better informed decision when shopping for outdoor camera systems. The International Electrotechnical Commission (IEC standard 60529) developed this rating. It’s akin to the British standard EN 60529. What the IP rating does on a security camera (and all electronic equipment) is classify and rate the degree of real protection (intrusion) it has against outside solids and liquids in various forms. The Ingress Protection rating consists of just two numbers. Let’s take a rating of IP67 to illustrate. It’s that simple. The first number is always the dust resistance and the second number the water resistance. The dust resistance goes from a scale of 0-6 with 6 being the most resilient. That means in our example, the device would have the maximum protection against dust. The water resistance goes from a scale of 0-9 with 9 being the most resilient. So in our example above, the device is well-protected but it’s not 100 percent resistant against water. It’s not bad, but it’s not perfect. Our example of IP67 translates to a device that is 100 percent dust tight and waterproof up to a point, i.e. by dropping the device for a short period under water. The aim of this standard is to provide additional and more detailed information to users. It came about to fill the blanks of the often vague marketing terms like “weatherproof” or “waterproof.” Both of these terms are shallow in meaning and can be misinterpreted. They don’t specify precisely what the device is weatherproof or waterproof against, i.e. hot days, shallow pools, extremes, or whatever. So the IP rating helps us to select a product that is reliable and likely to have a long life. 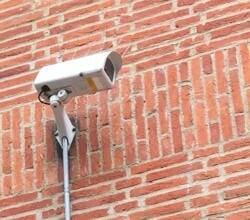 With regards to outdoor security cameras we need a much higher IP rating than say an indoor system. For more detailed information on IP Ratings you can view the IP Rating Reference Chart. I have a cat 5 wire at mt new drive way gate that is around 150 ft from house. I have ATT DSL that is 5 down and .7 up. I know that .7 is low for a camera but I I only use camera when I am away for long periods so not worried about effecting my internet use. I also do not care about recording. Any suggest on a stand alone wired camera for gate. ← What Internet Speed Do You Need to Support an IP Camera?